Mr and Mrs Rogers are one glamorous couple, and the celebration of their nuptials was art, glamor and emotion bought to life. Mahsa had her heart set on The Resort at Pedregal, whose exquisite dining options, breathtaking panoramas, and superior service make it the go to favorite of die hard Cabo lovers. Set on the sands of the Pacific Ocean, the resort boasts stunning vistas, ideal backdrops for the eager wedding cinematographer. The careful attention to detail evident in the design and execution of Mahsa and Jeffrey’s wedding make it deserving of the pages of any premier wedding publication. Mahsa was the epitome of the luxury destination bride, entrusting Blanc Bridal Salon with her hair and makeup. This seasons warm, neutral tones perfectly highlighted her stunning complexion, against which her pure white, figure-hugging gown shined. Panels of sculptured lace and transparent mesh injected a touch of the dramatic, and her swept back, low bun and diamond headpiece were the icings on the cake. During our first look, it was clear that Jeffrey approved. As he bent to welcome his bride with a kiss, it was more than evident that these love birds were meant to be. What struck us most about Mahsa and Jeffrey’s celebration was the perfect execution of even the smallest detail by wedding planner Amelia Marroquin, from Karla Casillas & Co. A long, elegant aisle adorned with rippling water features welcomed guests to the ceremony location, which on a day to day basis is the hotel’s impressive lobby. The Main Event Cabo‘s elegant altar comprised of sheer white draping, glistening crystal chandelier and lush rings of creamy white roses and orchids framed our couple perfectly, while keeping curious eyes away from the event spaces beyond. Reverand Marco Arrechiga conducted a ceremony dotted with personal anecdotes and more traditional exchanges, and before long it was time for the first kiss. As the sun set on the couple’s I do’s, the details kept on coming. A traditional mariachi performance by Mariachi Cabo opened cocktail hour, before the newlyweds made their long-awaited grand entrance down their second aisle of the day, an impressive display of cold fireworks leading the way. The bride’s brother gave a moving speech, drawing laughter and tears, and adding a touch of the personal to the reception dinner. 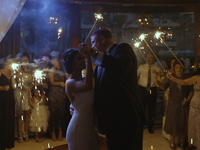 Mahsa and Jeffrey’s first dance was illuminated by the waving of sparklers and a glittering sky of gold confetti rained down on their traditional cake cutting. Each and every one of these “forever” moments was accompanied by the tunes of DJ Alex from Cabo Events and guests, dressed to the nines and ready to celebrate, danced late into the evening. A very big thank you to all involved in making Mahsa and Jeffrey’s dream destination wedding come to life, especially Sara Richardson Photography, whose creativity never ceases to inspire us. Until next time, Angel and Luz.